“I’ve recently completed my Level 4 Diploma in Regulated Financial Planning, which hopefully, is the first of many milestones to come in my finance career. I started with The Grad Scheme at Para-Sols back in August 2015 and although they talked me through a two-year training programme, I was given the reigns for the speed of my own development and secretly had hopes of completing my full diploma in that first year – what can I say, I’m a ‘Gen Y’ and some may say we’re an impatient bunch with high expectations! Admittedly, it’s taken a little longer than I’d first hoped, busy periods at both work and home, (Summer and cricket season in particular! ), meant I had to balance being realistic with my aspirations. So, I did just that and decided it was best to put one or two exams on hold for a few months until I had the time to really commit to the study. Fast forward to now, a little over 18 months since first starting the graduate programme, and it feels good to have this qualification safely tucked under my belt 6 months ahead of schedule (and just days ahead of my 23rd birthday!) 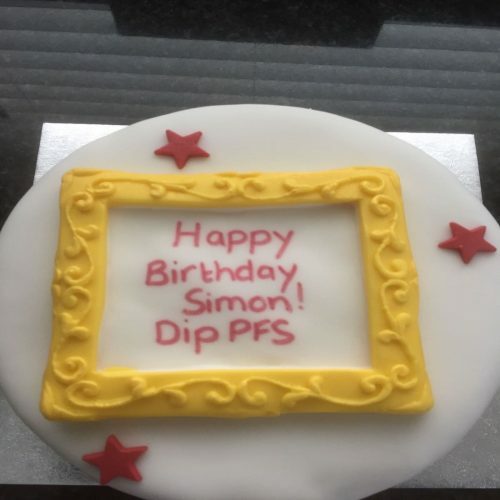 and being able to put those 6 little letters, DipPFS, after my name quite literally was the icing on the cake (see the pic, thanks Mum!). Combining my studies with my work was relatively easy, purely down to the fact that what I do on a daily basis teaches me more about the world of pensions, investments, tax etc. than any 300-page text book ever could. It’s incredible really, just how much you know about a subject without realising – it was only when I came to do doing traditional revision that I realised just how much knowledge I’d absorbed unconsciously and found I could skim over a fair amount of the revision material because of that (not that I recommend it for everyone!). The office environment is a huge help – Para-Sols has a really open, friendly and relaxed culture so I have colleagues sat in every direction ready and waiting to help. I know I can always text, call, email or even quiz my colleagues over lunch about anything I don’t understand and they are all happy to help and share their experience. Sometimes just hearing someone explain something to you in plain English is all you need. Plus, the way the training scheme is designed means that I get to check in with my mentor more formally once a month and make sure my development is still on track with where I wanted it to be. With my Level 4 now done and dusted, I’m already looking towards the Level 6, AF exams, (not before a little well-earned break on a Greek island though!) with a view to gaining my Advanced Diploma in good time and another step closer towards my ultimate aim of becoming Chartered in the next 3 or so years. As proud as am of myself, I’m very aware I’m just 20months into my career and there’s still so much I’m yet to fully understand and grasp in the world of finance. I’m expecting these next steps to be much tougher than the ones I’ve already taken, but I’m ready for the challenge!